now that I've finished my earrings for the earrings everyday we're all ears challenge (see previous post) this is what i have to work on next. This is my bead soup mix from my partner Heather in Nova Scotia . so this is now sitting on my work table egging me on. this is the tidiest it will ever be . I have two weeks to git 'er done. show-time is May 3rd. and it's coming up FAST. I missed last months challenge *sob* but I got this one in at the last minute. This months inspiration photo is from the Pottery Barn. While this is SO NOT my personal style, it really is a lovely tablescape. 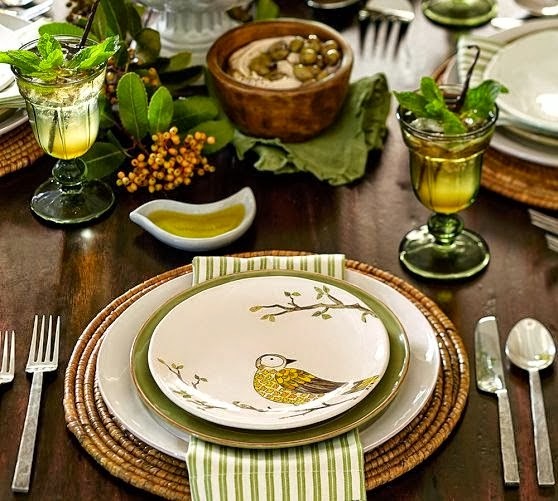 The spring greens, the lovely china patterns, the wood of the table , the woven round place mat , the oil for dipping, the olives in hummus, the minty beverages, gosh I'm getting hungry. I used MOP drilled rings for the main dangles, with brown crackle ceramic large hole beads (with centring caps to cover the holes); caramel coloured cats eye (faceted rondelles and small round beads); faceted green glass rondelles and green glass leaves. Ball headpins, jump rings and ear wires are all gold toned .